Melton shire is a residential and rural shire headquartered in the town of Melton which is 36 km north-west of central Melbourne. The shire is on undulating basaltic and alluvial plains, although its northern area includes foothills of the Lerderderg State Park. The basaltic plain was formed by lava flows from volcanic cones such as Mounts Cottrell and Kororoit. The open plains were ideal for hunting and coursing. An early settler, Thomas Pyke, had a property in the Toolern Vale area and organised several hunt meetings in the 1840s. It appears that the emerging village on the Toolern Creek was named after the fashionable hunting grounds at Melton Mowbray, England. The Melton road district was created on 16 September 1862, with an area of 242 sq km. It became a shire on 24 March 1871 and over the next 100 years was gradually enlarged by additions from Braybrook shire (Rockbank), Bulla shire and Keilor shire. When municipal amalgamations came in 1994 Melton shire grew further by additions from Bulla shire (Diggers Rest area) and Werribee city (Exford). Its area then was 528 sq km. Much of the shire in the nineteenth century was held as large pastoral estates. Simon Staughton’s Exford estate grew to about 100,000 acres by the mid-1860s and Sir Rupert Clark’s Rockbank estate was of a similar scale. 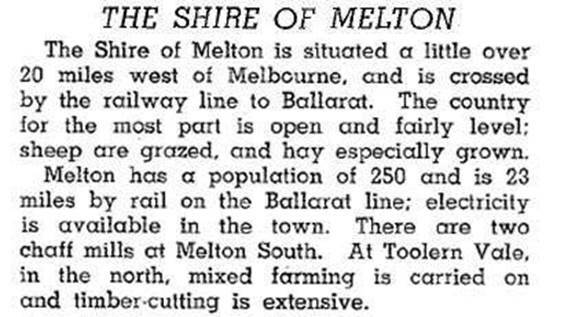 The Melton village on the road and railway to Ballarat had a few hundred people by 1900. Diggers Rest (on the railway to Bendigo), Rockbank and Toolern Vale, between them, had about 600 people. In the late 1990s another satellite suburb began, east of Rockbank. Named Caroline Springs, it too developed into a number of new suburbs such as Burnside, Burnside Heights, Hillside, Brookfield and Taylors Hill, the latter merging with Sydenham in Brimbank city. The Caroline Springs development was more rapid than Melton’s. Diggers Rest and Toolern Vale had a combined population of about 3150 (2011). Melton was among metropolitan Melbourne’s ‘most affordable’ (lowest-priced) places for houses. High or low-priced households find the price of community centre and council playgrounds cost about the same as in higher-priced suburbs, but residents’ financial circumstances put a cap on rate revenue. The shire council relies on top-ups from State and Federal budgets. Notwithstanding the shire’s urbanisation, opinion in 2010 was divided on changing Melton’s name from a shire to a city. Housing estates in Diggers Rest and Toolern Vale added to the debate.